They say that a picture is worth a thousand words, but just a few words from the artist brings true insight and understanding. 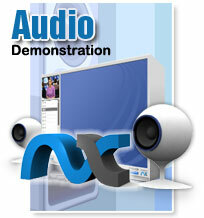 NX “Audio Presentations” help you to convey your thoughts and clarify your key points effectively. Audio voice-overs help you to bring your presentation to life with all the power and poignancy your voice can bring. This sample NX Audio Presentation will discuss some of the benefits of using NX and demonstrate how easy it is to create a powerful Audio Presentation in just minutes. Think the Demo is Cool? You Should Try the Real Thing. Real estate presentations. Sales presentations. E-Learning systems. The possibilities are endless with NetXpression, now with exclusive “EasyImport”® technology.